Recently, I contemplated getting a Vespa again but decided, instead, to stick with my pretty but slow bicycle. My commute is about 2 miles but using San Francisco’s public transportation, generally takes 26 minutes from door to door. Too long! I can get there on my bike in 16 minutes but I have to drive in traffic, wear a helmet, find parking and lock my bike up. The parking/locking takes about 10 minutes or more, pushing me right back to 26+ minutes. So I was on CalTrain, going down to the colocation center AGAIN because my server has bad memory and crashed on a daily basis, and I noticed a commuter with a Xootr. Ouuu! A Razor for adults. It had bigger wheels, a sleeker look, was light and folded into a tiny pile. I wanted to know where I could find in in San Francisco so I used my awesome Sprint Mobile Broadband (Thanks Luce!) to get online and I checked out the prices. $260. Wow, 1/10th the price of a Vespa and with no DMV fees, Insurance costs and Class M license requirement. I’m sold! So I put my laptop to sleep and began to fall asleep myself. 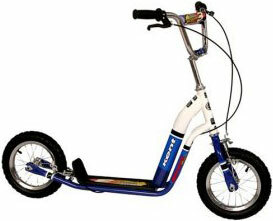 As I was about to start dreaming, I remembered my FAVORITE CHILDHOOD BIKE-THING, the Kent Super Scooter. Mannnn, did I drive that all around the rural streets of Louisiana. That scooter was awesome..it had brakes and some small bicycle wheels. Yet was so light (18 lbs which feels like nothing on wheels) and fun. They were all the rage. If you grew up in America and are around 30, I bet you had one too. Mine was blue and white JUST LIKE THAT! Could I still fit on this thing? Will it fit my size W9.5 foot? Wow, only $60 on Amazon?! I’m buying TWO! One for me, one for my friend’s kid who calls me Nanna Crumble. She’s just about the age I was when I got my Kent Super Awesome Scooter and her birthday is coming up. So I temporarily signed up for Amazon prime and got $30 in free shipping. While Prime came with free 2nd-day, the magically scooter got here overnight (just like my Litter Robot :D)And guess what? My foot totally fits! I have a size 8 in men’s and would guess that this could do a good 9.5 or so. San Franciscans should consider buying this scooter. It’s so light and the hand brakes are especially useful here. It’s really easy to hop on and off while navigating through busy sidewalks. I even took it on Muni (the J) with me. You can park it in your office and safely ride on the sidewalk. And.. people love it. On the way home, I got stopped by adults and kids like 4 times wanting to know more about the scooter. Now I just gotta find cool stickers to put all over it. I’ll start at unamerican.com. I’m also looking into modifying the handlebars to come up a little higher. I saw the perfect set (tall yet thin) at the Bike Hut at Pier 40 but it wasn’t for sale :| Riding the scooter requires that I bend my knees anyway but I’d still like to see what it would be like with taller handlebars. So if you are a commuter in a metropolitan area or a parent looking to give an awesome gift, consider getting a Super Scooter. No, this isn’t a paid advertisement ;) I just think it’s great that it’s possible to still love riding this thing 18 years later. Awesome scooter. I need one of those. Loved your scooter blog! Customer Service at Xootr is extremely challenging to deal with and the scooters are expensive too. I wonder if there’s a market for scooters for adults?? I’m scooter obsessed and keep looking for the perfect scooter… I’d love to market one. Did you ever find some higher handlebars?? Check out the “Kent Scooter and Kick Bike System” on amazon.com. It looks like it solves the handlebar height issue for adults (200 lb capacity too) plus it has a set of pedals so it works like a bike too. Does anyone know where to find spare wheels for my kent super scooter 3. I love it to death but some of the spokes are broken and i need to buy replacement wheels. Please Help! I was thinking of asking for this scooter on Christmas…I’m 14 years old, and wanted to make sure that I am not too old or too big for this? I am 5’4. The main thing I need to know about is the handle bar height….are they way too low where it is uncomfortable to ride? Right now Amazon has a sale for $45 so I’d like to utilize it if this scooter is appropriate for my size. Kent super scooter is very good and pretty cool. It offers hours of entertainment and fun rides around the destinations. The inflatable tires give a smooth ride that can handle a variety of surfaces. Where can I get the wheels for my Kent scooter? Plze help me…! the scooters just use regular 12″ or 14″ bike tires. the good thing about these scooters is the ability to fix with standard bike parts. I’m thinking of getting one of these for my son this Christmas as he would love it. Thanks to the comments above also providing links to other scooters.